I made two batches of granola, one with oil and this one without. This granola is crunchier and a little dryer, however it is quite tasty. Use this granola as extra flavor and fiber in your favorite plain greek yogurt. Preheat oven to 325 degrees. Take a baking sheet and cover with parchment paper and then spray with olive oil. Mix all of he dry ingredients together. Mix wet ingredients into the dry and blend together. 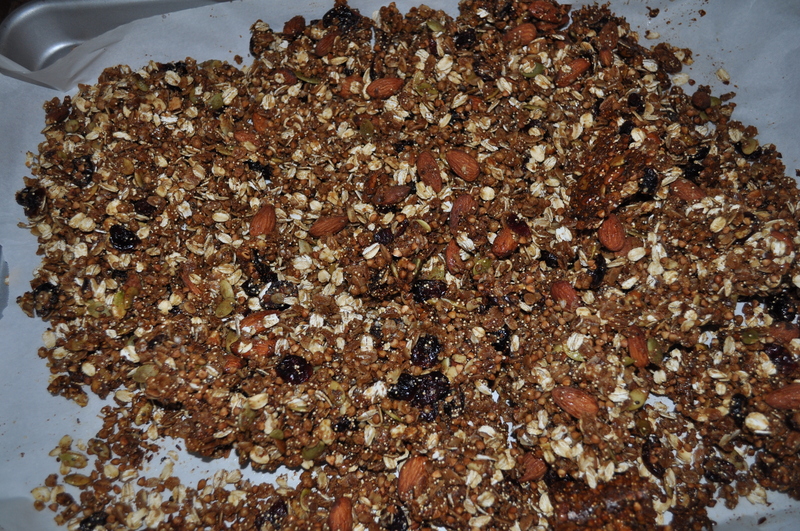 Spread the granola on the baking pan and bake for 30-45 minutes or until golden brown. Allow to cool for 10 minutes then put in freezer for 30 minutes. Transfer to a airtight container.